It made our Top 5 Chart Toppers last fortnight, and Elena Risteska’s Tequila & Lemon just keeps growing on me. There is something about the tempo of this song that is absolutely hypnotic, and when we don’t have it playing out loud, it’s stuck in our head – ALL THE TIME. Last week it was Basim’s other 2017 single Aji Aji which took 2nd place, but this fortnight we’ve changed our loyalties! Although both singles are very alike, it’s Comme Ci Comme Ça that’s had the most airplay between the two. It’s certainly getting us through the summer! Our first new entry in the Eurovision Union Charts this week is from former Norwegian Eurovision artist Aleksander Walmann, and as we found out recently, he will be back for seconds as he is part of this year’s Melodi Grand Prix, and luckily for him, he is back with such a catchy track. It’s safe to say we’re totally addicted. 2018 Melodifestivalen hopeful LIAMOO hit our charts last fortnight, but his song It Ain’t Easy is becoming more and more of a favourite. The radio friendly pop tune is a staple in our current playlists, and I’m looking forward to see what he’s got in store for his Melfest performance. This song is just too catchy not to be in our Top 5. It’s another song that’s become a true addiction in the last fortnight, as it’s the mix between rap and pop that’s really on my radar. Although we love the song as a whole, it’s the choruses that really get me turning up the volume! Although it’s gone down a spot in our Charts since last time, Salmo’s rap tune Perdonami isn’t off our radar. It’s one of those songs that when it does come on, I want to listen to it at least 10 times in a row. Being only 2 minutes and 15 seconds, it’s a song that ends before its time, hence the infinite repeats! Another song that’s always on repeat is Basim’s second track on this week’s Chart Toppers. Other songs come and go, but I think both of Basim’s 2017 singles will stick as the year goes by, as the Danish/Middle Eastern fusion is a truly catchy combination! When this collaboration first dropped, I wasn’t a fan. The roughness of Fabri Fibra didn’t seem to gel with the clean cut sound of Tiziano Ferro, but as time goes by, I miss Tiziano’s presence on the song if I listen to the solo Fabri Fibra version. It’s obviously still a favourite, as it remains in our Top 10. Nadav Guedj has taken a bit of a hit since our last Eurovision Union Chart, as the young Israeli artist was our top pick, now jumped down to number 9. We’re still loving the song, but it just hasn’t been our top played in the last fortnight. Although Nadav Guedj dropped down in our Charts, young Italian artist RIKI managed to jump up a few places. We have to be in the right mood for songs such as Se Parlassero di Noi, as it’s more of a ballad style song, but it seems that the mood struck over the last two weeks. The build over this song is unreal, and we can’t wait until he hits that big chorus. Another song that’s dropped from our Top 5, but far from forgotten is this incredible tune from X Factor alumni Måneskin. We know we’re in for a good time when we hear the opener, ‘Hi everybody this is Måneskin, you’re listening to Chosen, listen clear now baby, because it begins like!’ Bring on more from this young band! We’ve recently been listening to Emis Killa’s most recent album, Terza Stagione, and although so far we’re enjoying it, sometimes it’s hard to go past the songs you’ve been listening to for months. There’s nothing more satisfying than keeping up with the pace of this rap, and although we can only belt out a few lines at a time, we’re still satisfied! It’s that catchy mix of rap and pop that’s dominating our playlists, and this is probably one of the best examples of this style. They’re one of the biggest duos in Italy, and it’s easy to see why they’re much loved. Kristian Kostov is absolutely killing it at the moment, and this single is representative of that. Other than winning awards, and performing at international events, he is releasing incredible music. He has one of the brightest futures ahead of him, and we can’t wait to see what he has in store for 2018! Fusion music seems to be the way to go this fortnight, as we’ve got rap and pop, we’ve got Danish and Middle Eastern and from Emis Killa we’ve got a Latin and Italian mixture that has really hit the spot. It feels like it should have a place on a big Western style action movie! Another newcomer to this week’s charts is 2017 Swedish Eurovision representative Robin Bengtsson with his latest single Day by Day. It’s a bit more stripped back compared to his Eurovision entry, but this song really shows off the sensitive side. It’s soulful, and it suits him well. One of our national final inspired Chart entries this week, Aron Hannes is back to dazzle us once again in the Icelandic National Final. This year he’s back with the song Gold Digger, and it’s pretty quickly become our favourite from the competing group of 12! This modern Italian pop tune from the young duo Benji & Fede is still catching our attention, although dropping a few spots since last fortnight. It’s Italy’s answer to the boyband, and sometimes you just need a bit of boyband in your life. I can imagine this song absolutely going off if it was to hit the Eurovision stage, and I think Ida Maria has a big chance with this incredibly awesome tune. It’s in the running to represent Norway at this year’s Eurovision, and although it has tough competition, this might just be what Norway needs to keep its place in the Eurovision top 10 this year! The Scottish artist now based in the US has come to our attention with the song Dream, and it would be a song like this that could bring the UK some Eurovision success – if only. It’s anthemic, a few steps above Molly’s 2014 Eurovision entry, and although we’d love to see Bishop Briggs hit the Eurovision stage one day, perhaps she is destined for bigger things. 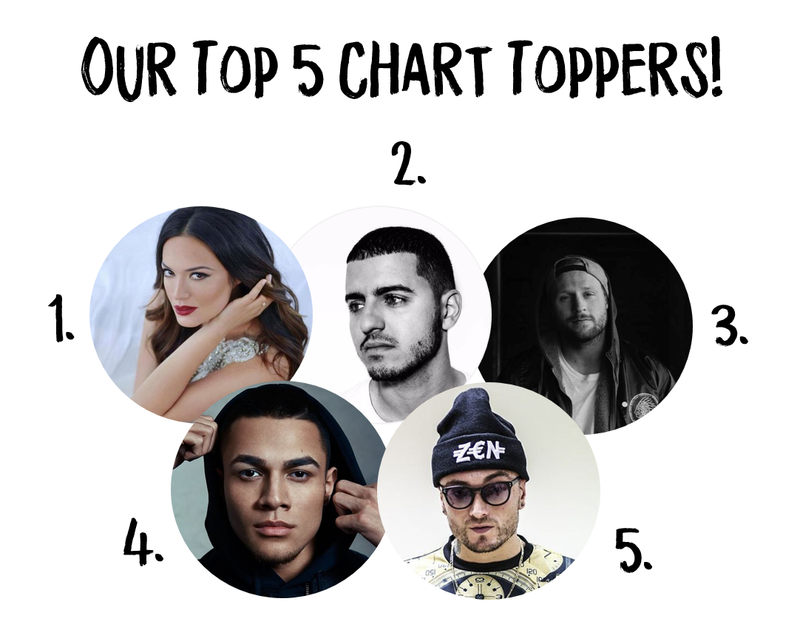 Check out our previous Chart Toppers here! You Decide: Meet the UK Eurovision Hopefuls for 2018!